Covering a sub-tropical expanse of 269 km2, Phibsoo Wildlife Sanctuary (PWS), located in southern part of Bhutan is the smallest of the ten national parks in the country. It borders India from Sunkosh River in the west to Sanathang River in the east. In the southern belt, PWS is connected to Indian protected areas - Petu Reserve Forest, Buxa Tiger Reserve, Ripu- Chirang Reserve Forest and Dhaneshi Ridge. Historically, PWS’s origins dates back to as early as 1974 when it was first designated a Reserved Forest. It was only in 1993 that PWS was upgraded to a wildlife sanctuary. 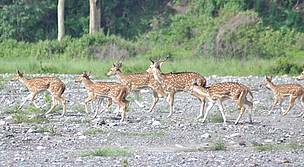 Two unique characteristics that sets PWS apart from other protected areas in the country- Spotted Deer (Axis Axis) and natural sal (Shorea robusta) forests, found nowhere else in the country. Besides these, PWS also harbours other important tropical species such as elephant, gaur and golden langur. PWS had long remained a paper park ; it was only in 2009 that the first steps toward conservation efforts began. The park is also recuperating from the scars of the country’s militia problems in the 1990s - the lone reason for its isolation for so long.